BAT - BLOG : BATMAN TOYS and COLLECTIBLES: THE DARK KNIGHT RISES - Harkins Theatres BATMAN Movie Tickets Giveaway! THE DARK KNIGHT RISES - Harkins Theatres BATMAN Movie Tickets Giveaway! 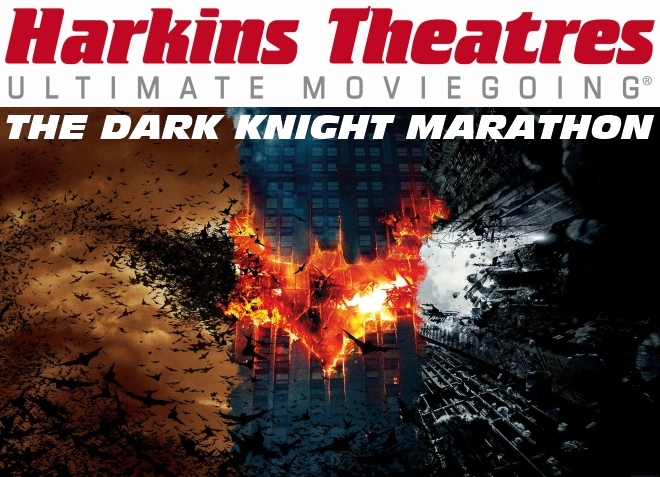 On July 19th, Harkins Theatres will hold the Ultimate Dark Knight Marathon showing all three Christopher Nolan Batman Movies in consecutive order and tickets are on sale now. But, by joining in this contest YOU can win some free passes! OK, there are a few simple rules to the contest you must follow. First, you must live in the states/cities where Harkins has an actual location, or live extremely close and be willing to travel there on your own. A list of the locations is down below so please be sure to check that BEFORE you enter. Second, you have to send us your complete name/address information in an email with the title "HARKINS DARK KNIGHT MARATHON" in the title. You can do that by clicking right HERE! The contest starts right now and will end on July 14th, 2012. On that night, at Midnight ( Central Time ), we will randomly pick 2 names out of a hat. The 2 Winners will then be contacted on July 15th with instructions on how they can pick-up their prizes. Remember, Please be sure to check the list down below to make sure there is a location near you. We can not give tickets to people living too far from those locations, sorry. In advance, we apologize to the people who don't live near these places and can't enter. I mean, it only makes since that you have to live near the buildings where these movies are shown. Thank you. Here are the list of cities and for more information please click HERE!